Cake mixes are a convenient alternative to baking from scratch, saving you time and worry, particularly if homemade baking isn't your forte. Most boxed cake mixes call for two to three extra ingredients including water, eggs and oil -- most frequently vegetable oil -- which serves to bind all the ingredients together in addition to adding extra moisture for a moist, tender cake. You can swap in other oil and non-oil alternatives, in place of vegetable oil, and still produce a tasty, rich cake. Some of the substitutions, such as applesauce, have additional benefits such as reducing calories and sugar content in your cake. Reduce the amount of fat in your cake with veggie and fruit purees. Purees made from produce add moisture to the cake to prevent it from drying out or crumbling apart. You can use various different fruits and veggies as a puree, keeping in mind that the stronger the flavor, the more you will be able to taste it in the baked cake. More frequently used purees include applesauce, banana, pumpkin and sweet potato. HOW MUCH TO USE: Substitute 3/4 to 1 cup of fruit puree and 3/4 of a cup of veggie puree for every cup of vegetable oil called for in the recipe. HEALTH BENEFITS: Deliciously moist, applesauce has far fewer calories than oil. You will hardly notice the difference in your cake, either in texture or taste. 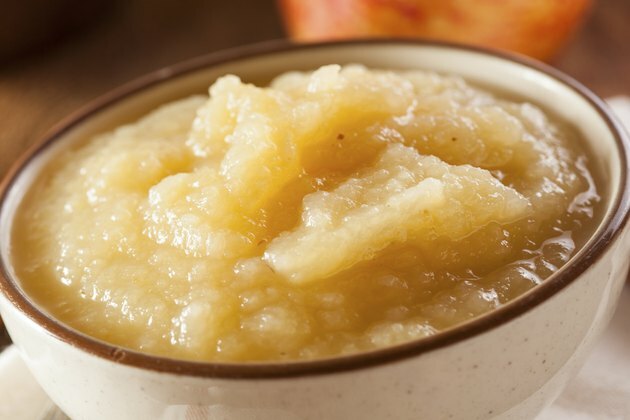 Applesauce adds no fat calories and, if you use unsweetened applesauce, this will reduce the sugar content. Coconut or olive oil can be used as an alternative to vegetable oils, including canola, and grapeseed oils, in a cake mix. The Fine Cooking website suggests that using pure light olive oil rather than extra-virgin to produce a milder, tender cake can also save you money. HOW MUCH TO USE: Substitute olive oil for vegetable oil in equal measure. You can also swap coconut oil one-for-one, but you must measure it in melted, liquid form. HEALTH BENEFITS: Olive oil contains healthier monounsaturated fats, which aid in reducing your risk of heart disease and high cholesterol when eaten in moderation. Coconut oil consumption has been hailed for its nutritional value and benefits to cardiovascular health. The oil should be used in moderation, however, due to its high calorie and saturated fat content. 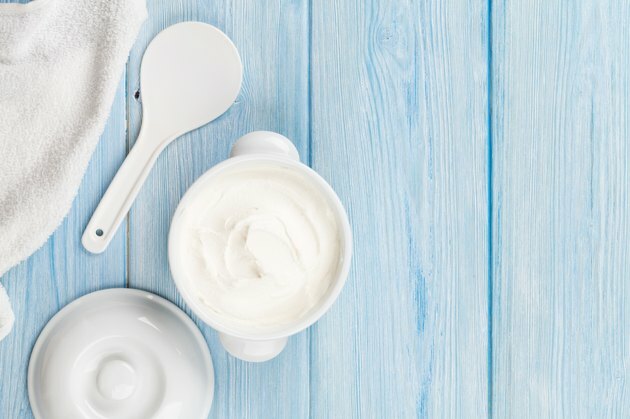 You can substitute vegetable oil with dairy products, recommends Angie Thayer, a registered dietitian and food and regulatory specialist for Wilton Brands. Yogurt, buttermilk, sour cream and mayonnaise are a few options, and while mayonnaise may sound like a stretch, it comes closest to oil and, surprisingly, does not alter the taste of the cake. HOW MUCH TO USE: With the exception of buttermilk and yogurt, replace every cup of oil with 3/4 cup of a dairy substitute. For buttermilk, use 3/4 cup of buttermilk mixed with 1/3 cup of butter; for yogurt, cut the oil in your recipe back by substituting ½ of the amount of oil with ¾ the amount of yogurt. HEALTH BENEFITS: Reduced-fat dairy products can help reduce overall fat and calorie consumption. Reduced-fat products may produce a drier, denser mix, so try adding 1 to 2 additional tablespoons for extra moisture. 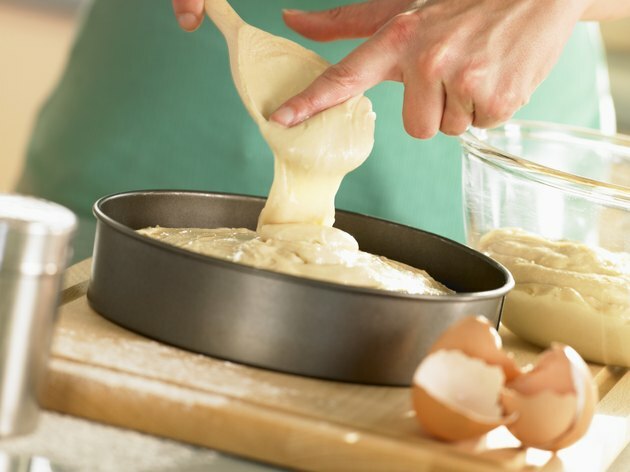 You can substitute butter for vegetable oil when preparing your cake mix. Melt the butter prior to mixing it with other ingredients to avoid clumping and ensure smooth, even distribution and texture. Butter makes for a slightly denser cake due to its richness and is ideal for stacked, layered cakes. HOW MUCH TO USE: Use an equal amount of butter as you would vegetable oil, or a 1:1 ratio, adding it cup for cup with your mix. HEALTH BENEFITS: None. 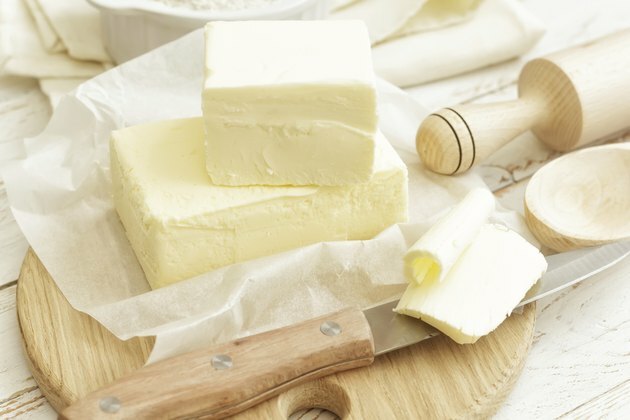 Butter is saturated animal fat, and most vegetable oils contain healthier monounsaturated or polyunsaturated fat. Nutrition and Food Science: Omega-6 Fatty Acids - Bad for Heart Health?